Fatimah (sixth right) presents a memento to Yakub, witnessed by Assistant Minister of Women, Family and Childhood Development Rosey Yunus (sixth left) and other members of the Kenyan delegation. KUCHING: Delegates from the Mendera County of Kenya are bringing home valuable lessons from Sarawak after attending the 19th Pacific Early Childhood Education Research Association (Pecera) Conference here, and also sitting down with Welfare, Community Well Being, Women, Family and Childhood Development Minister Dato Sri Fatimah Abdullah to learn about what Sarawak has achieved. 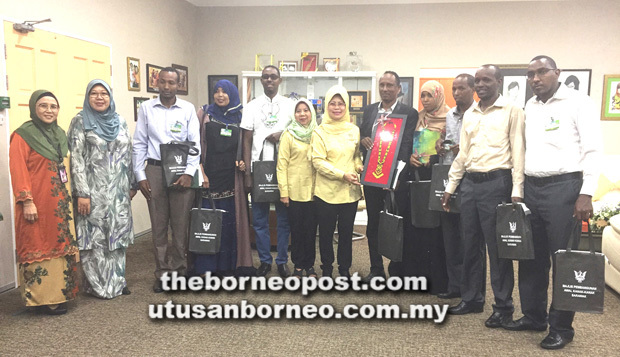 Speaking to reporters after paying a courtesy call on Fatimah yesterday, Mendera County Assembly member Yakub Hassan Emboi said the first thing they wanted to implement would be their version of Sarawak’s ‘Early Childhood Care and Education (ECCE) Council’. “In other parts of the world, this (ECCE council) can only be found at national level. When we go back, the first thing we’re going to do is form this council, which will oversee and review (childhood care and education) at county level. We never thought there could be a council at this level,” he said, adding that their visit to Sarawak had been all about the comparison of ‘childhood affairs’. According to Yakub, Malaysia is more developed than Kenya, which achieved independence in 1963 – the same year when Malaysia was formed.